Okay — this is an admission of what a geeky nerd I truly am. In lieu of being with family and/or friends on a Saturday night, one of my favorite things to do is hunker down at home, turn on public television and enjoy Britcoms, those reruns of old BBC half-hour comedies. I love them! I’m a huge fan and they never get old. 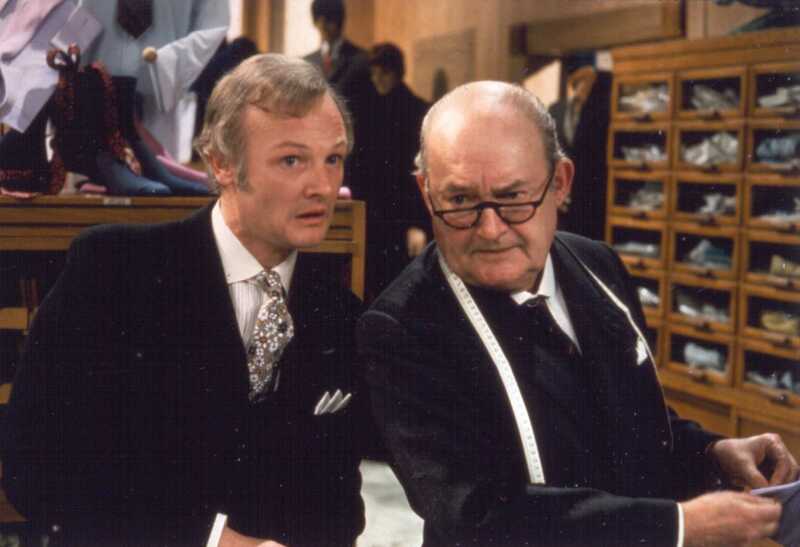 My favorite is “Are You Being Served?” (pictured) with Mr. Lucas and Mr. Grainger and the original young Mr. Grace — I could do without Mr. Spooner or young Mr. Grace’s brother. I also adore “Keeping Up Appearances” with astounding female comic Patricia Routledge playing off an endearing cast of frustrated neighbors and family plus “Vicar of Dibley” with the amazing timing of actresses Dawn French and Emma Chambers and some of the wittiest dialogue on TV. I also love the upper-class stylings of Penelope Keith in “To the Manor Born” and “The Good Life,” and then there’s Judi Dench slumming and having a blast in “As Time Goes By.” And whenever John Cleese’s “Fawlty Towers” comes on, it’s a gold-star Saturday night. Two stars if “The Office” and “Yes, (Prime) Minister” are on and three for “Absolutely Fabulous.” And if I’m ever lucky enough to find “Doctor Who,” well, I think I would run out of stars. This entry was posted in Uncategorized and tagged actors, actresses, BBC, Britcoms, Doctor Who, entertainment, public television, television, TV, weekend by Coffee with Cathy. Bookmark the permalink.